As a coastal city in northern Portugal, Porto will surprise the food lovers. The food in Porto draws from the contrasting landscape on the mild ocean side, the Trás-os-Montes isolated mountains, and the hillsides of Douro Valley. As a result, you will find delicious seafood from the Atlantic. The Trás-os-Montes region brings hearty meats and cheeses. While the Douro Valley will seduce you with rich and sweet Port wines and its fine red wines. Ready to start eating the best food in Porto? Here are 10 popular and authentic Porto foods every food travelers to Porto should try. The Francesinha is a warm sandwich that will catch your eyes at first glance. The name literally means “little French girl”. It is said to have been brought to Porto by an immigrant returning back from France. This sandwich is an adaptation of the French toasted sandwich, croque-monsieur. A Francesinha sandwich is made with bread, ham, sausages, and steak. It is typically covered with melted cheese and an egg on top. 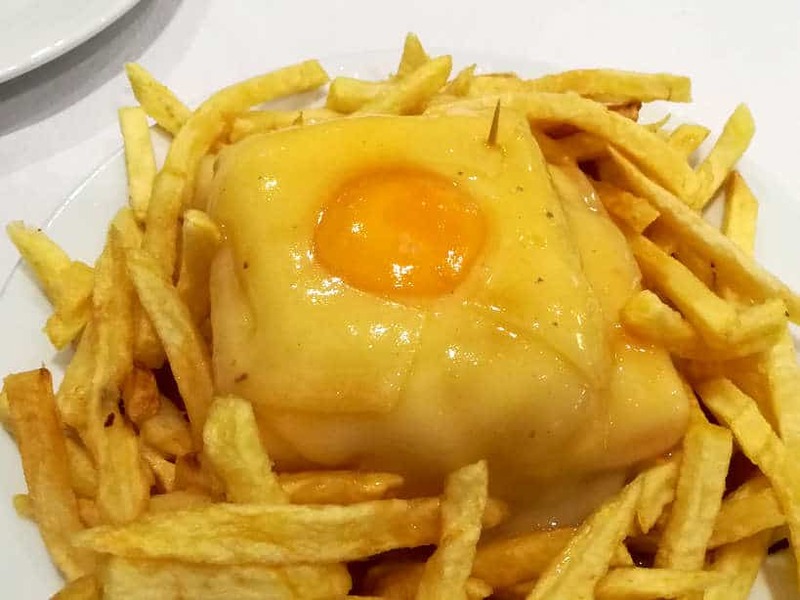 Though, what makes the Francesinha unique is the secret sauce that each restaurant prepares with its own touch. It is a hot thick tomato and beer sauce to dip or “flood” your sandwich in. And the best part is that you can ask for more as needed. To round up this “calorie bomb” sandwich, you get an accompanying side of french fries. While we enjoyed this famous Porto food, it does pack a lot of meat, cheese, and sauce together. We recommend having it with the local Super Bock beer or a glass (or more) of vinho verde. You may want to eat in moderation and try the other Porto food specialties from this list! 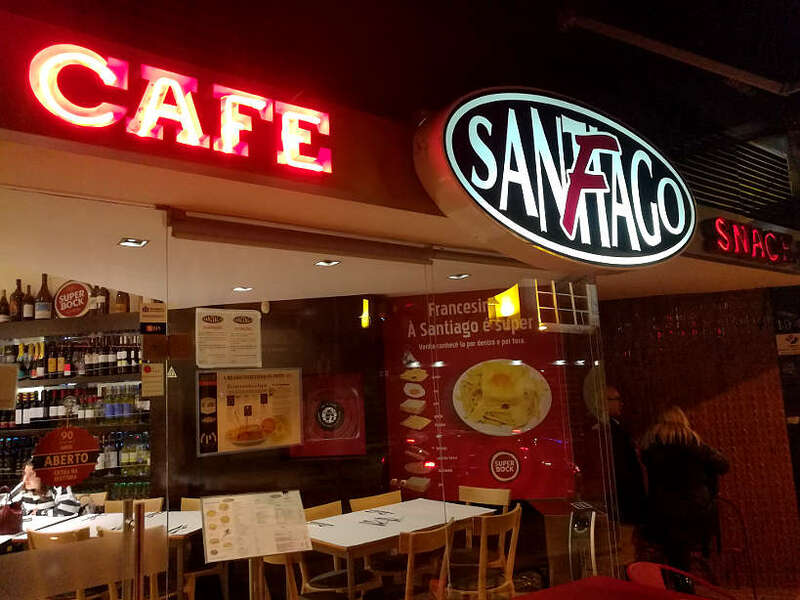 Café Santiago is known to be one of the best places to have Francesinha according to the locals. We actually stumbled on this café unknowingly while looking for another restaurant. Attracted by the bustling local crowd inside, we stepped in and didn’t regret it. Their main specialty is the traditional Francesinha sandwich, but you’ll also find other Porto foods on the menu as well. The ambiance is casual and convivial. The food is fresh and tasty and the service friendly. 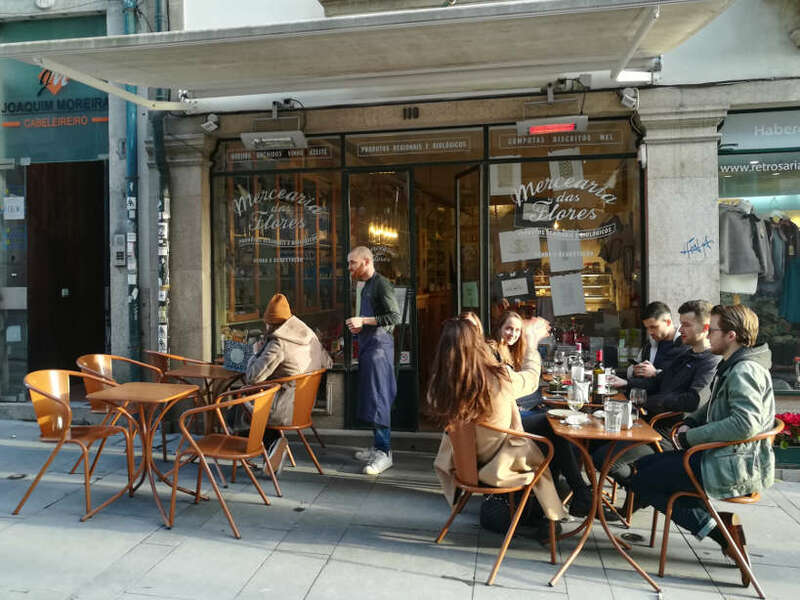 A nice local café to taste Porto foods. Click here to see the reviews and book your table. If you prefer to explore the food in Porto with a local guide, we recommend taking a food tour with Context Travel. 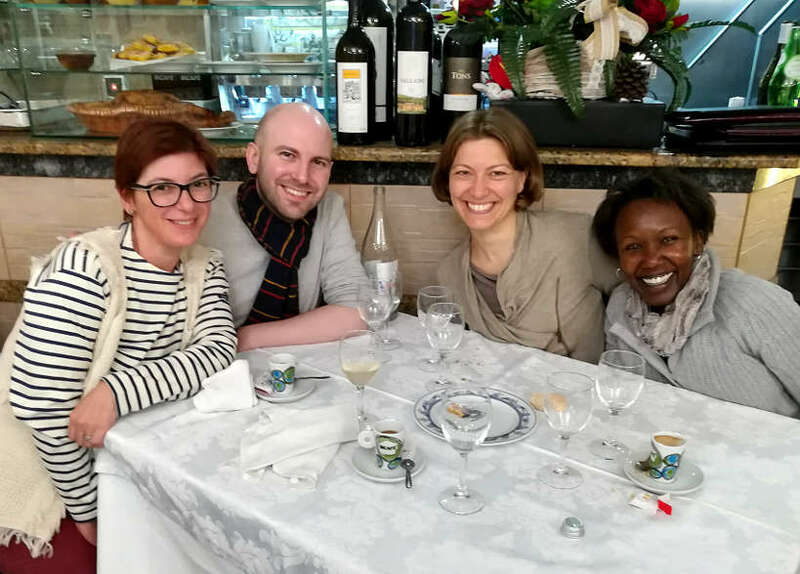 We’ve taken several of their food tour including in Lisbon, where we sampled Portugal’s iconic foods on a Bica to Ginja Food Tour. 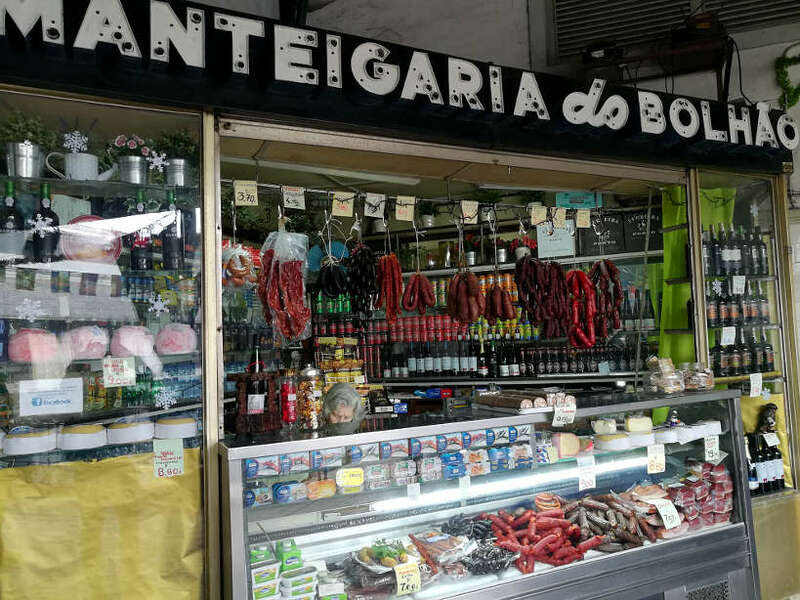 The Context Travel food tour in Porto is a 3-hour food tour led by a local, covering many of the local specialties listed here. Dive into local specialties including francesinha, bacalhau and more. As you walk around Porto, learn the history of this historic city and finish off with local Portuguese sweet treat. Considered Porto’s official dish, this is a stew of cow tripe, smoked meats and white beans typically served with rice. The story behind this dish is fascinating. According to legend, when Henry the Navigator, was preparing to conquer Ceuta (North Africa), he asked the people of Porto for their support. With generosity, the people gave all their choice meats to feed the sailors, leaving nothing but tripe for themselves. Through imagination and creativity, the people of Porto used the leftover tripe to create “Tripas à Moda do Porto” earning the nickname “tripeiros.” In May 2015, Porto marked the celebration of 600 years of “Tripas” in Porto. This dish typically consists of tripe, pigs’ feet, chicken, smoky sausages, white beans, flavored with cumin, curry, and cloves. We honestly did not enjoy this local specialty. We tried it as part of our mission to explore the local flavors. While the taste was not bad, the chewy texture was off-putting. One of the best places to eat in Porto and to sample this Porto classic is Casa Nanda. This is a very traditional and old fashioned restaurant where only the locals go. It has a reputation for being the only restaurant in the city where grandmas who cook, will go for lunch or dinner. Alheira sausages are white, smoked traditional sausages from the northern region of Trás-os-Montes. They are very easy to find in Porto restaurants and are typically served with fries, rice, and a fried egg. The main ingredients in these horseshoe-shaped sausages are poultry (chicken and turkey) or game meat (duck, rabbit, venison, pheasant). The original Alheira were pork-free sausages said to have been invented by the Portuguese Jews during the Inquisition. When the practice of the Jewish faith was outlawed, Jews were identified as they lacked traditional pork sausages hanging from their smokehouses. To disguise themselves as “New Christians”, they created their own sausage, made from a blend of non-pork products. During the same period, another traditional sausage called “Farinheira” was also invented by the Jews to escape scrutiny. The main difference between the sausages is the filling. The alheira sausages are made with poultry or wild game, whereas the farinheira is filled with flour and spices. We really loved the smoky, garlicky and earthy aromas of the alheira sausages. Just one bite and you’ll quickly understand why they are so famous. Today, the alheira is found all over Portugal. In Porto, it is common to find it in supermarkets or local eateries. To get a good “homemade” version, visit the vendors near Mercado do Bolhão market and have fun learning more about it. Bacalhau, dried and salted codfish, is Portugal’s national treasure. This dish is so popular that there are over 365 ways of preparing bacalhau, and some say over 1,000 ways of serving it. You’ll find codfish prepared in myriad ways, from baked, barbecued, canned, fried, served with potatoes, rice, and other variations. One of the most popular ways locals enjoy bacalhau is eating them fried as codfish cakes. In the north of Portugal, they are known as bolinhos de bacalhau or pasteis de bacalhau everywhere else. These little bites are delicious. The recipe calls for a heavy presence of cod and mashed potatoes, as well as plenty of parsley, onions, and eggs. These tasty and flavorful codfish cakes are easy to eat. We enjoyed them hot as appetizers or starters. You’ll find bolinhos de bacalhau everywhere. Our favorite place to try these traditional codfish cakes was the local, off the beaten path restaurant, Escondidinho do Barredo. This traditional tavern is hidden near the waterfront in the Riberia area. It is family owned and run by two sisters. The restaurant serves a number of Portuguese classic dishes such as cod fritters, octopus, and cuttlefish. The food is traditional and centered on old recipes. This puff pastry was one of Rosemary’s favorite local delicacies. Pastéis de Chaves are half-moon shaped pastries, traditionally stuffed with minced veal. This puff pastry is a specialty from the city of “Chaves” in the north of Portugal, close to the border of Spain. It is now classified as a product with Protected Geographical Indication. 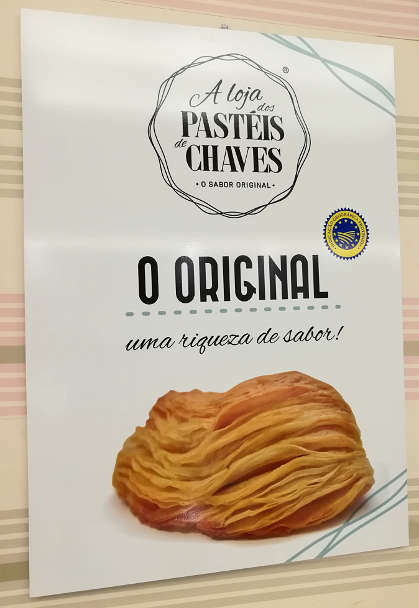 This means they can only be called Pastéis de Chaves if made in Chaves. The story of the pastry goes back to 1862. A saleswoman is said to have traveled through theTrás-os-Montes province with a basket of weirdly shaped pastries. so delicious. The “flavienses” (people from Chaves) loved them, but there were not enough for everyone. The founder of a local pastry store, Casa do Antigo Pasteleiro, purchased the recipe and started producing them. The rest, as they say, is history. This pastry has grown in popularity throughout Portugal to the point of becoming protected. In Porto, the specialty store, A Loja dos Pastéis de Chaves makes these delicious pastries the traditional way, by hand. Besides veal, you’ll also find pastries filled with bacalhau (codfish), chicken with chili or sundried tomatoes. Vegetarians can delight in mushroom or vegetable filled Chaves pastries. We were surprised to find sweet options such as chocolate and egg cream/almond filling. This open and airy specialty store that opened in Porto in 2013 is the best place to taste the traditional recipe. The store is owned by a family, originally from Chaves. The Pastéis de Chaves are made in small batches, every day and served warm and fresh. Make this your only stop for Pastéis de Chaves in Porto. Broa de Avintes is one of the most famous bread in Porto. It comes from Avintes, a local town on the other side of the Douro River, near Porto. 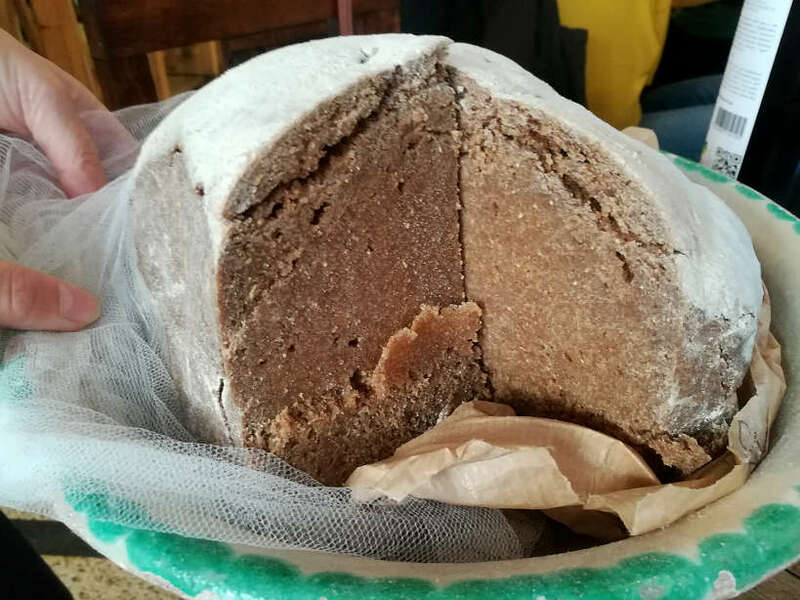 This bread is a very dense, dark brown bread, widely eaten on local tables in the northern side of the country. Bread is such an important staple of the Portuguese cuisine that each region has their own local version. The Broa de Avintes is quite unique with its coarse crumb and distinctive flavor. It almost looks like and feels as dense as a heavy banana cake, without the sugar. Broa de Avintes is made with corn and rye flours. Typically, the baking process is slow, whereby the dough cooks for about 6 hours. This bread can be served warm in typical dishes. It is also served with starters or to accompany soups. We enjoyed this unique bread very much with cheese and ham or simply as bites before a meal. The bread itself is dense and softly sweet and leaves you wanting more. Note, it can be quite filling, so don’t indulge in too much bread right before your meal! Mercearia de Flores is a great place to have lunch in Porto. It is a quaint and charming deli store that sells high-quality Portuguese products in downtown Porto. You can sample the local products as well as enjoy an olive oil tasting and freshly made delicious sandwiches. The Broa de Avintes is served with the ham and cheeses starters. 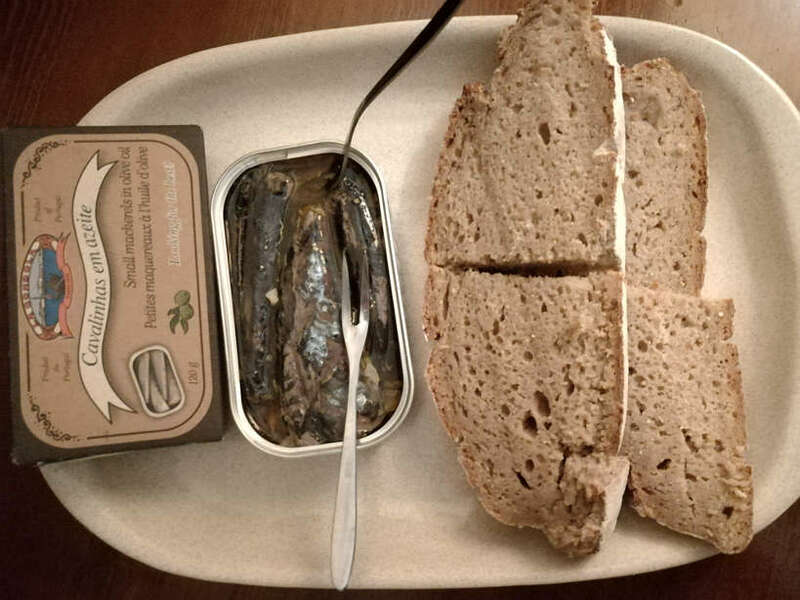 You can also have it as a sandwich, with sardines, or you can buy it to go. This cute place is a great stop to leisurely sample and taste Broa de Avintes and other local Portuguese products. 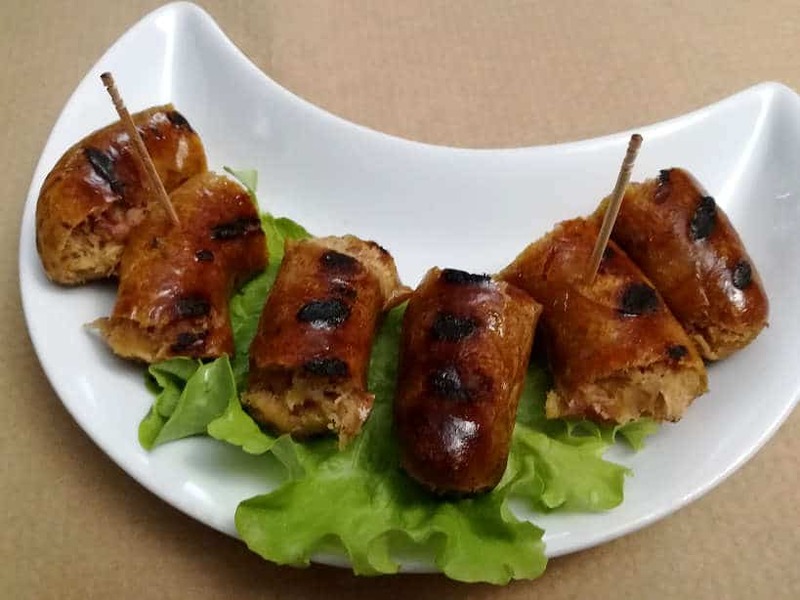 Petiscos are Portuguese “tapas”, which are small bites, but generally small versions of dishes and are usually meant to be shared. 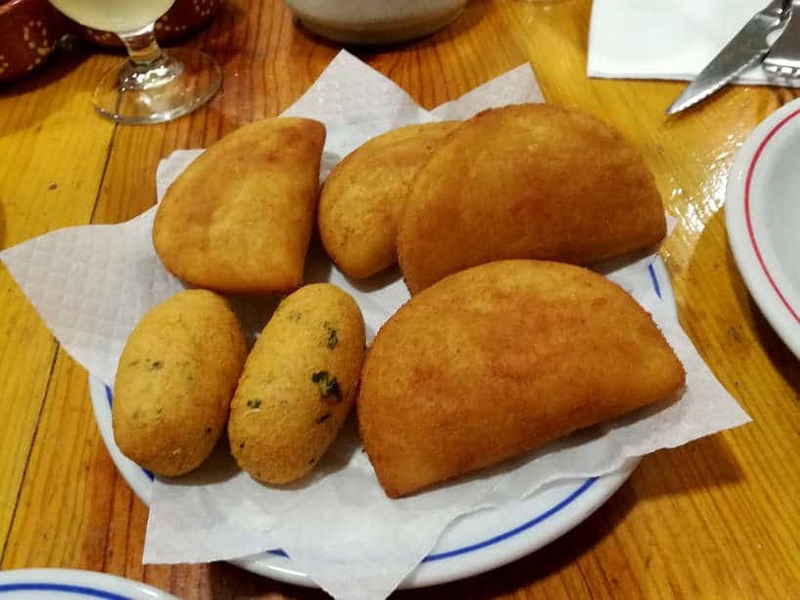 In Porto, petiscos are served with good local bread like Broa de Avintes, accompanied by delicious local wines. Canned fish, including sardines, mackerel, tuna and more are beloved in Portugal. They are part and parcel of Portuguese identity. Today, canned fish have gone gourmet in Portugal. Many local cafes and restaurants serve canned fish as starters or appetizers. 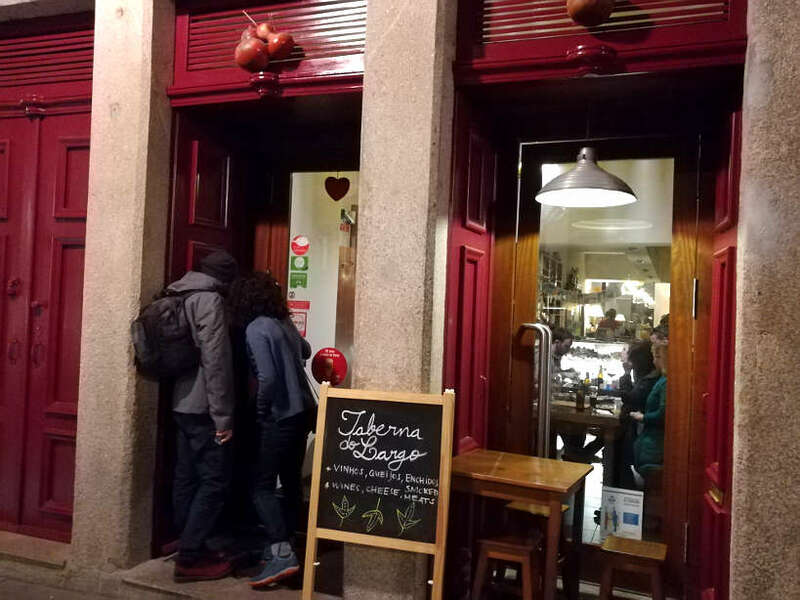 Taberna do Largo in Porto is one of the best places to eat petiscos. We loved the quaint and cozy atmosphere at this little spot where we enjoyed canned mackerel with local bread and wines. Even though the mackerel was from a can, the flavors were outstanding. 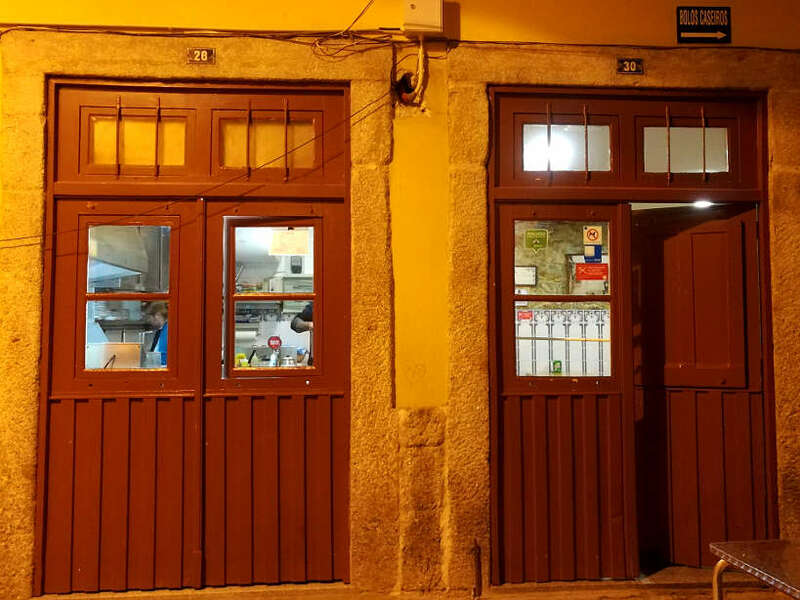 You’ll find this unassuming place to eat in the historic district of Porto. Owned by two female friends, this place has been around since 2013. You’ll find a wide selection of traditional foods and drinks from the north of Portugal and all over the country. Don’t miss this good cheap local place to eat on your travels to Porto. Hours: Tuesday – Thursday, 12:00 pm to 12am; Friday 5pm to 1am; Saturday: 12pm to 1am, Sunday 12:00 pm – 12:00 am; Closed on Mondays. The almond is one of the most widely cultivated fruits in the Douro region, with 60% of the Portuguese almond production. Almonds are typically grown side by side with olives and vines. During the blossom season, a month before spring, the Douro valley is covered in white. Following the official Almond Blossom route is the best way to enjoy the beautiful and serene landscapes. There is a famous Portuguese legend that tells the story of the Almond trees that came to Portugal thanks to a Moorish King. To please his Nordic Princess who missed snow, he ordered the planting of almond trees to remind her of snow. Many Portuguese desserts are made with almond. The almond tart or Tarte de Amêndoa is one of the most popular desserts in the northern region of Portugal. It is a simple pie made with almonds, sugar, butter, and milk. While the dough is made of eggs, flour, sugar, and butter. There is no almond paste in the filling which makes it light and crunchy. The divine almond flavors come from the chopped almonds on the crust. This is a deliciously sweet dessert packed with almonds and one of the best food in Porto. Check out this recipe to make your own almond tart at home. Confeitaria do Bolhão is one of the oldest and most popular pastry shops in Porto. It is an inevitable stop when you are in Porto. 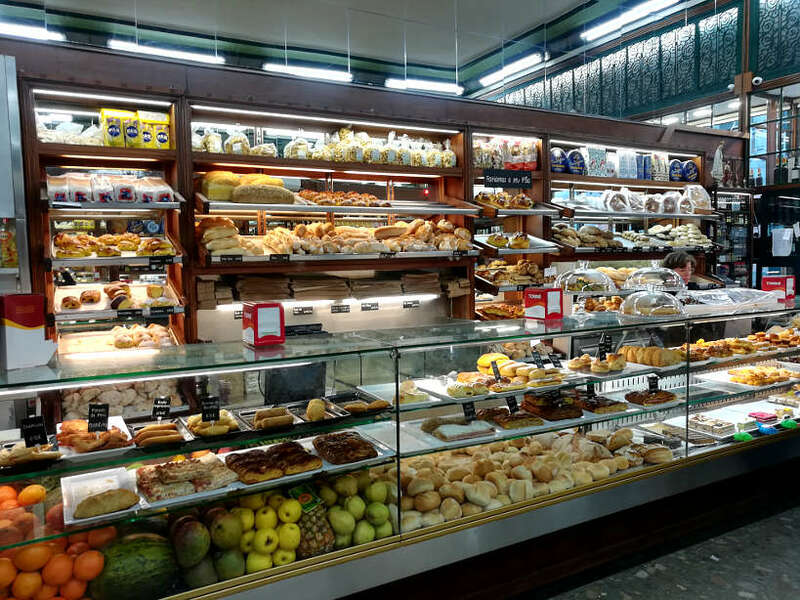 Located across the Bolhão Market in downtown Porto, Confeitaria do Bolhão has always been a popular breakfast stop for locals on their way to the market. 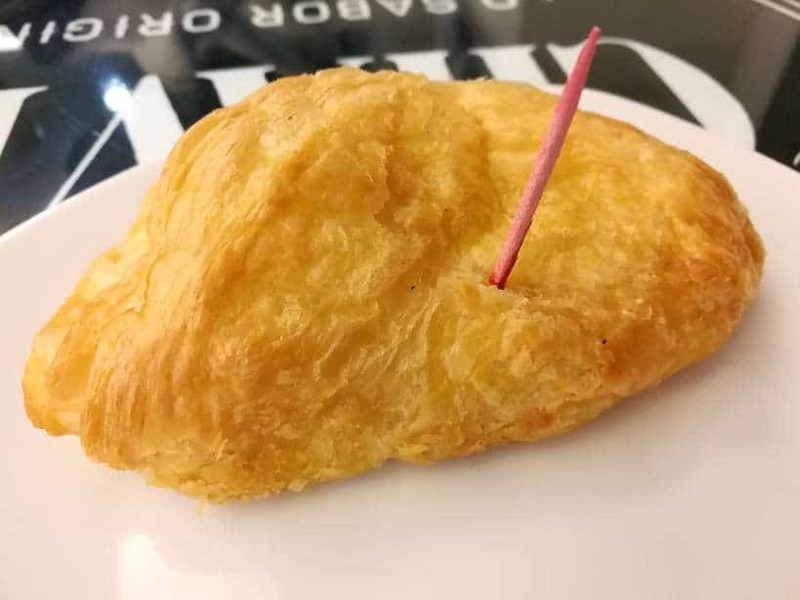 You will find many additional pastries including the Jesuita described below, and other delicious Portuguese treats. The pastries are fresh and delightful. Don’t be surprised if you stop here more than once during your stay in Porto. Hours: Monday to Saturday, 6:00 am to 8:00 pm; Closed on Sundays. Like many desserts in Portugal, pastries have religious names due to the fact that most were made in religious convents. We’ve written before about conventual sweets or doces conventuais, and these desserts featured prominently when taking a food tour in Braga, Portugal’s most religious city. 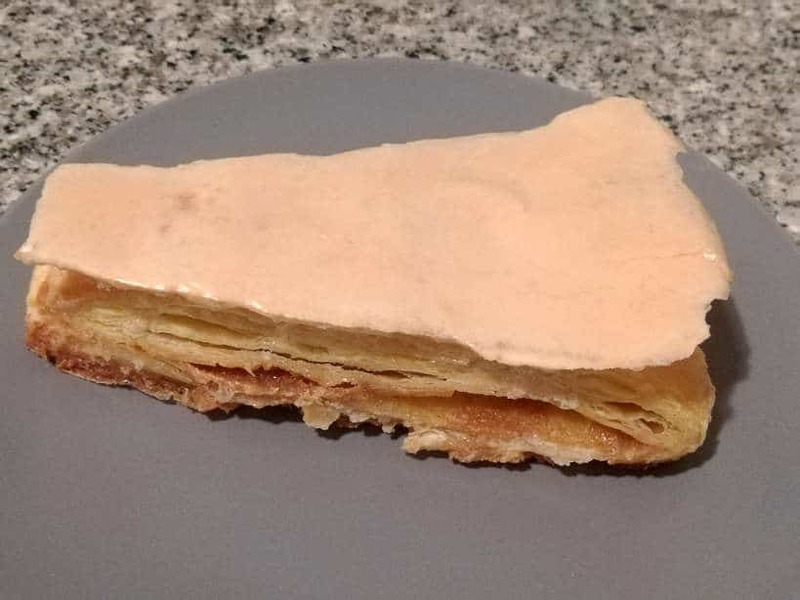 This pastry has a triangular shape and is made of puff pastry, filled with cinnamon egg cream (doce de ovos) with a crisp sugar glaze crust. Jesuítas are a typical sweet of Santo Tirso city in the north of Portugal. A pastry chef who worked with Jesuit priests in Spain is said to have brought the dessert over a century ago. The shape of the Jesuita mimics the frocks worn by the Jesuit priests. Even though the shape of the Jesuíta is small, it is packed with flavor. The combination of the pastry and crispy crust is divine. When dipped in a hot cup of Portuguese coffee, flavors become creamy, melting your mouth. One bite and you’ll quickly fall in love with this dessert, a favorite Porto food. It is hard not to go back to Confeitaria do Bolhão for more pastries. The opportunity to taste the Jesuita gives you yet another excuse to do so. Toucinho Do Céu literally translates to Bacon from Heaven. 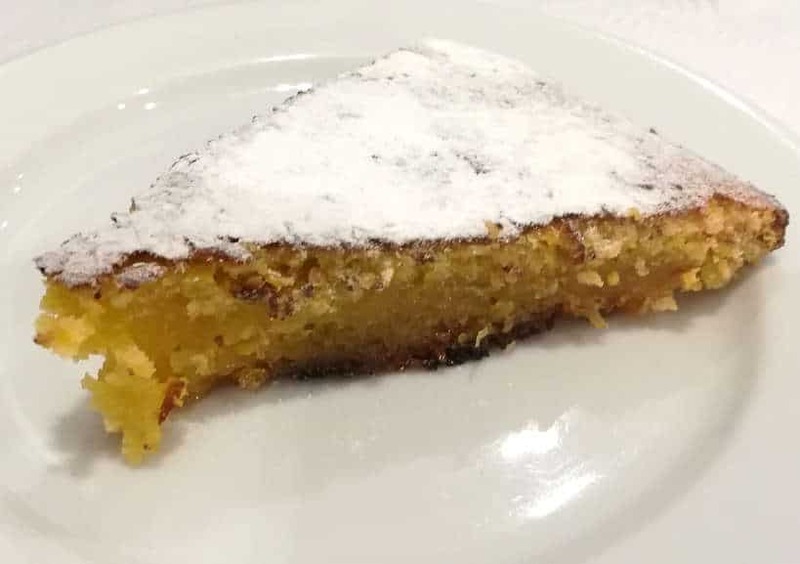 This is a wonderful almond cake from the northeastern region of Porto. So, why does the name reference pork? Well, pork fat is used to make this cake. And secondly, the taste is heavenly and unbelievably delicious. Its divine references come from the fact that it was made by nuns from northern Portugal in the eighteenth century. This is a very popular Portuguese dessert made with almonds, eggs and as mentioned, pork fat. It is quite sweet and easily eaten in a few bites. The taste is really smooth and you don’t really notice any pork taste. It is mostly packed with delightful almonds flavors. 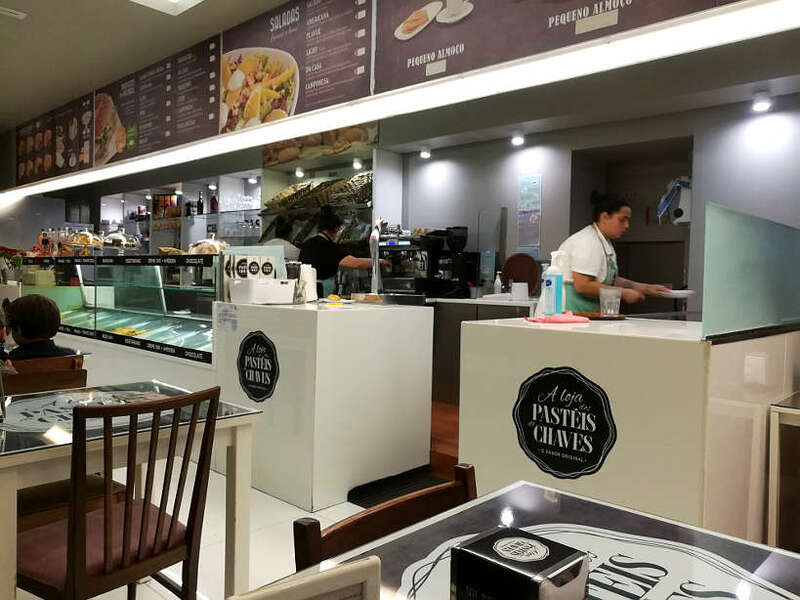 If you still have room after a Francesinha, Café Santiago offers a delicious Toucinho Do Céu. You could also stop by for an afternoon snack or lanche as the Portuguese call it. The dessert is really fresh and not extra sweet; a homemade pie made with real almonds. Address: R. de Passos Manuel 226, Porto. Visitors to Porto will delight in these popular foods in Porto. In this indispensable Porto food guide, you will find what to eat and where to eat the best local food in Porto. Whether you love seafood, sweets or unusual dishes like Tripe, there are delicious Porto foods awaiting. 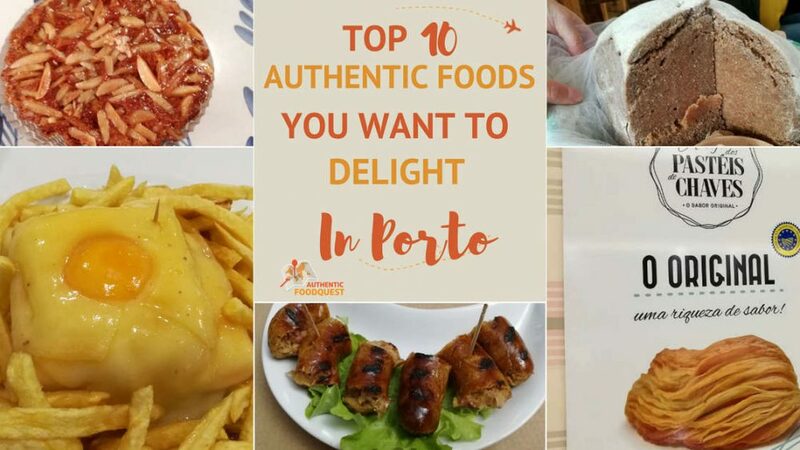 This list of top 10 Porto foods is not exhaustive. These are some of the most typical and traditional dishes we enjoyed and the ones you don’t want to miss. Porto is an easy city to get around. The best way to get to the best places to eat in Porto is by walking and taking public transportation. We recommend getting a Porto Card, which not only has discounts on transportation, but also free access and special discounts to museums, restaurants, shops and more. With amazing local dishes, spectacular wines, including the famous port wines, you will enjoy a spectacular culinary experience in the region. Do you like the food in Porto? Which of these dishes have you had or would like to try? Leave your comments below. To get the most out of your stay and enjoy the delicious food in Porto, choose to stay in a centrally located area close to all the activities and local food experiences. Charm Palace Porto one of the most romantic buildings in the city, retains its charm from the early 1900s. Conveniently located near Santa Catarina street and Bolhão Market, you are a stone throw away from Porto’s main shopping center and a typical market not to be missed. Feel like royalty at this lovely boutique hotel with extremely helpful staff willing to go the extra mile for you. If you are looking for “a home away” with access to your own kitchen, book your stay in a spacious modern loft-like apartment. Porto White City Lofts are located within walking distance of the historic Bolhão market. You’ll also enjoy access to numerous restaurants and the best places to eat in Porto, all within walking distance. This renovated guesthouse is the former residence of prominent scholar and writer Carolina Michaelis, the first female professor of Portugal’s prestigious University of Coimbra, in the 1900s. The building features typical Portuguese design architecture, including a central staircase, skylight, and Juliet balconies. overlooking, Rua de Cedofeita, a pedestrian shopping street. One of the highlights of the guesthouse is breakfast. Follow the smell of freshly baked bread to the garden. Find a wide selection of local and seasonal produce including cherry tomatoes, olive oil, and balls of butter and avocado. Orange juice is squeezed on the spot. The first sandwich sounds so satiating Rosemary. When you begin mixing all those meats you have a classic. Toss in some cheese and you are even more set. I do go veggie most of the month as my wife is a vegetarian but reach a point where I need a little meat mix. Then I am good for the remainder of the month and feel light, chill and satiated. What a list of foods here. The francesinha sandwich is not for the faint of heart…and neither for the vegetarians. We had it only once and while it was delicious, it packs way too many calories. The story behind the food is interesting though and the people of Porto love it! Thanks Ryan!! There are so many delicious foods in Portugal and I feel like I didn’t even get a small taste of everything there. I wish I was able to stay longer to try all of these places. This just means I need to make another trip back and add Porto to my stay. Great post! Thanks so much and so glad you enjoyed the article. 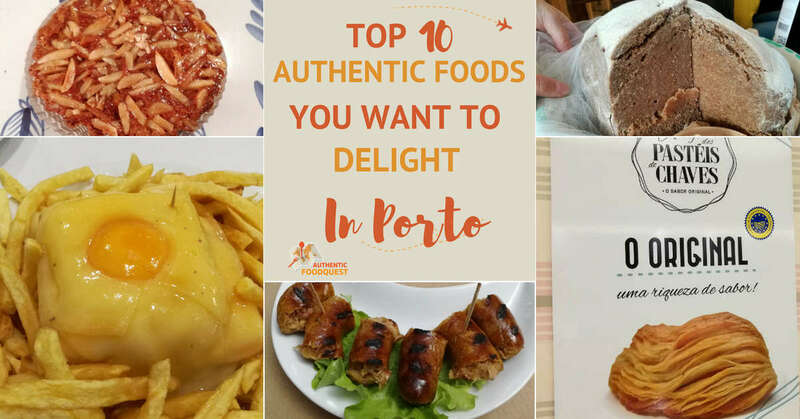 Porto has so much to offer and there is even more beyond this list of 10 authentic foods. You are right, another trip is definitively warranted to explore more of the region 🙂 Appreciate your feedback. There’s nothing better than eating authentic and delicious food in a foreign country. I’m hungry now…the desserts and the fish cakes look so good! Thanks for sharing! I went to Porto last year and fell in love with the food. I don’t eat meat and many of the traditional dishes contain sausage, tripe or beef but I was still able to find so many great restaurants. If I had only read your guide sooner, I would have known all the best spots to eat in. The desserts all look delicious! It would be so difficult to choose one. I found the generous use of almonds pretty fascinating. I loved the food in Portugal although I still haven’t tried a lot of these!! I did have a Francesinha though and nearly had a heart attack – it was delicious but one was definitely enough! Indeed, the Francesinha is quite an experience and one is plenty. We shared ours 🙂 Definitively recommend heading back and trying more of the local dishes. Amazing food and wines in Porto. Thanks, Claire. Glad you loved the article. It’s unfortunate many traditional Portuguese/Porto foods are not vegetarians. However, you can always ask the restaurant to modify the dishes to your liking 🙂 Still worth exploring the food in Porto. This is not a post to read when you are hungry! There are so many stuff I like in this post but my favorite has to be the fried codfish cake. I didn’t even like fish when I first tried it but I loved it. Also the pasteis is a delight! You absolutely cannot go wrong with the codfish in Portugal. So many ways to eat it and always prepared fresh!! Ahh! Food! I’m a foodie traveller myself so I love reading about local flavors of new places. The Francesinha Sandwich is the perfect kickoff to a delicious list, but the almond cake?? I can already taste it… Love it! Awesome, so glad as a fellow foodie traveler, you enjoyed the article!! Everything is so delightful, the trick is watching the calories 🙂 The almond cake is truly amazing!! I am drooling already. 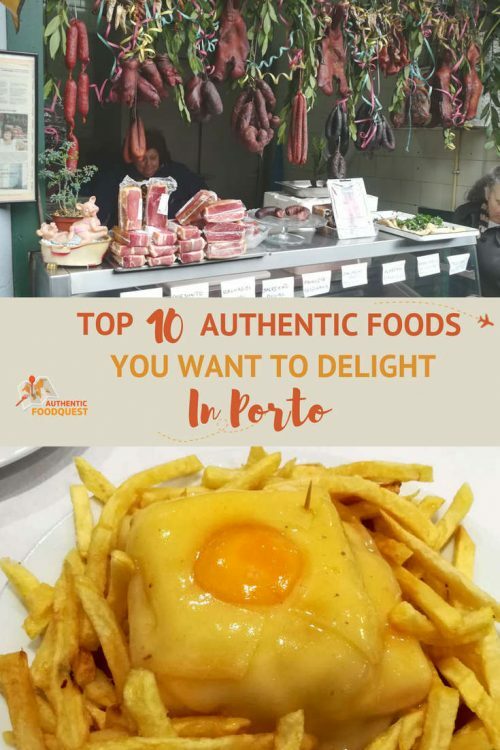 I love to travel for food and this list seems perfect for me to explore Porto foods. Thanks for sharing. You are most welcome. The food in Porto is divine and worth the trip 🙂 Cheers! Porto seems the perfect place to enjoy a good vacation. Eating some local food is a must when you travel 🙂 Porto has some incredible food. I would love to taste Bacalhau and of course this delicious Toucinho do Ceu… Now I get my mouth watering ! There is so much to see and do in Porto. If Portugal is on our travels plans, highly recommend visiting Porto and tasting these delights for yourself. Thanks for stopping by. We are total foodies too so thanks for these recommendations. The calorie bomb hahaha sounds amazing. Desserts are crucial for us so the almond cake sounds and looks the best in our opinion. How crazy they use pork fat to make it! Thanks for explaining that! Love the details of your posts. So glad you enjoyed the article. As foodies, you would love all the amazing food Porto has to offer. In Portugal every single part of the pig is used. The good news is that there is no porky taste in the sweets 🙂 Thanks for stopping by!! This is exactly the kind of resource I want when I’m traveling! I plan my trips around activities and photo opportunities, but when I’m already there is when I want to know where to go for authentic food. This is great! The Tarte de Amêndoa looks amazing!! So glad you find this article valuable. 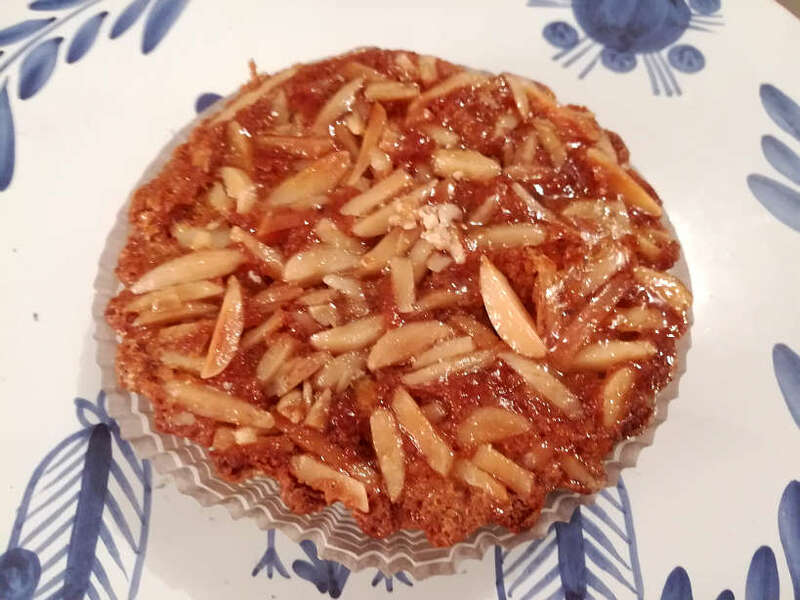 Our goal is to inspire people to travel through food and providing them with the resources they need to do just that 🙂 The almond tart is amazing, and worth the trip to Porto 🙂 Appreciate your feedback, Tracie. We loved so much of the food in Portugal. There are a bunch of things here that we haven’t tried yet. A good reason to go back. But must admit that I really did not like the Francesinha sandwich. Maybe I didn’t get a good one. We became quite addicted to Pasteis da Nata. But the Pasteis de Chaves were great in Columbria. You are right Linda, there is so much to discover about the food in Portugal. This is only a sampling of what you can find in Porto. We also found the Francesinha sandwich pretty heavy, though tasty. Can’t go wrong with the Pasteis de Nata! So many reasons to go back to Portugal and to Porto! Thanks for stopping by! Porto has been at the top of my list for a long time and port wine is a big part of that. I had no idea almonds were grown in the area and had never thought of seeing an almond blossom trail. I will definitely try cod cakes when I visit. When are you planning on visiting Porto? Be prepared for an amazing time and delicious food and wines. We were surprised as well to learn about the huge almond production. It makes such a difference to eat them fresh 🙂 Try everything on the list, you love the new tastes and flavors. Thanks Sherianne! Pasteis de Chaves sound right up my alley! Very interesting selection of regional treats. So glad you enjoyed the article, Kristen. The Pasteis de Chaves is delightful!! Wow, there is a lot of different dishes I have never heard of. It was very interesting to learn about the different dishes. I think the desserts look tasty especially the almond cake. Thank you for sharing it was fun reading about the different dishes from Portugal. This article comes at the perfect time as I will be visiting Porto for the first time this week! I now have a good idea of what I’ll be looking out for. Thank you! Perfect timing! Please let us know what you end up trying. Have fun!! Wow I have been to Lisbon (never Porto) and never saw any of these goodies around. The pastries look so delicious, really hoping to get to Porto on my next trip to Portugal. Don’t miss the chance to visit Porto. It’s easy to get to from Lisbon and it is a charming city in its own right. Hope you visit soon!! With the exception of the tripe (which I just can’t manage to wrap my head around) I think I would love everything on this list but what really stands out for me are the pastries. They sound SO delicious and decadant! Totally with you Vanessa, tripe was our least favorite dish, but it is a local delicacy worth trying. The pastries are divine and they will make up for any “tripe” experience. Thanks for stopping by! All of the foods you highlighted look great, except maybe the tripe. 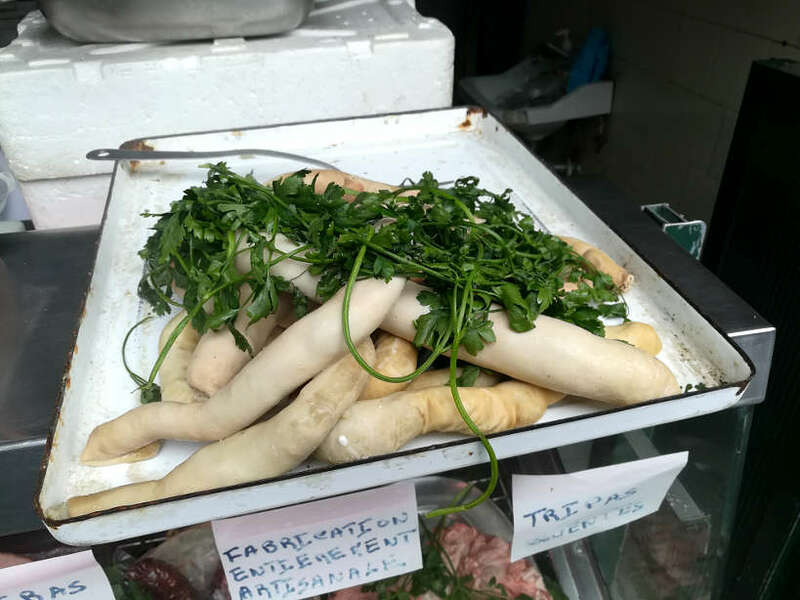 I know people love it, and I consider myself a pretty adventurous eater, but I still can’t get over the “ick” factor of tripe. That’s something I need to work on I guess… and I wouldn’t mind going to Porto to try! Thanks, Mags, while the tripe may not sound appealing. It is surprisingly flavorful. Not our favorite, but definitively worth trying. If not, everything else on the list will give you a flavor of the city 🙂 Thanks for stopping by! Oh I so love this post, dreaming of going to Portugal to eat! Talk about a meat and dessert lovers paradise. Definitely up for the Toucinho Do Céu, Pastéis de Chaves and Cod fish cakes. Nice to see the canned fish plays a big role in food there! Bookmarked for my future visit. Awesome and so glad you enjoyed the article. The food in Portugal is amazing and it is worth the trip 🙂 Take this handy guide with you and enjoy exploring all the local flavors!! Amazing variety of food there. Though I toured around the place, missed out on these delicious stuffs. Next trip will be solely for these food. Perfect!! Please do come back and let us know what you think 🙂 Have fun in Porto!! I missed trying the famous Porto sandwich when I was in Porto. It reminds me of an over-the-top version of a Croque Madame, which makes sense since it was a French immigrant that brought it to Portugal. I’d also try the sausages. I think I need to give Portuguese food another shot because I didn’t really love it when I visited. Indeed, do give Portuguese food another chance and go for the local specialties. You’ll be surprised at the gems you will discover 🙂 Cheers, Jennifer. Whoa! I can see why Francesinha Sandwich is #1. I need this in my life asap. The almond pie also looking amazing! I am heading to Porto in a month. I can’t wait to use this guide. Perfect timing Stephen. Have a blast and do let us know which of these dishes you enjoyed. Safe travels. You truly cannot beat the almond pastries in Portugal. Yum. Did you eat any of the local Porto specialties? Such a good range of delicious foods in Portugal! Your posts are always so tempting. Loved the look of Jesuítas, almost wanted to bite into them. Awesome to hear Indrani. Thank you. Food is such a wonderful way of traveling…and a great way to learn about the local culture. My time in Porto was short and sweet only couple of days but I have put on weight coz i was eating my way round to their delightful food and ofcourse drinking Porto wine in every meal. My favourite was the different sausage especially the Chourico Assado it was fascinating watching it being serve in a clay pot in flames. You are right, it’s easy to pack on the pounds in Porto and Portugal in general. Indeed the chourico assado is fun to watch. Porto is a great city with so much to offer! Glad you had a great time. Oh man, I’ve read so much about the food in Porto lately and this post isn’t really helping to make my mouth water less. I’ve been exposed to Portuguese food in Mozambique and can just imagine what the Broa de Avintes must taste like in Porto. And the Pasteis de Chaves look incredibly delicious. It might be a sign that Porto is in your future travels 🙂 Portuguese food is great all over. Hope you get to experience it in Portugal soon. Cheers. Whoa. That calorie bomb sandwich is intense! I love the flavor of almond, so I’m dying to try the almond cake at Toucinho Do Céu. Porto looks like they do food right! You are right, Porto does food right. Some more calorie-laden than others, but all good! Thanks, Kate.